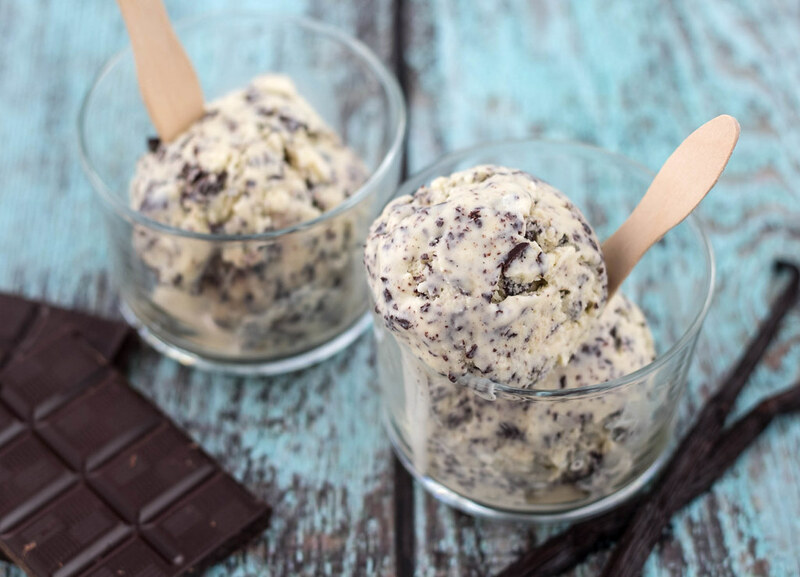 We would start saying that this is our top-1 ice cream – it’s just super delicious! 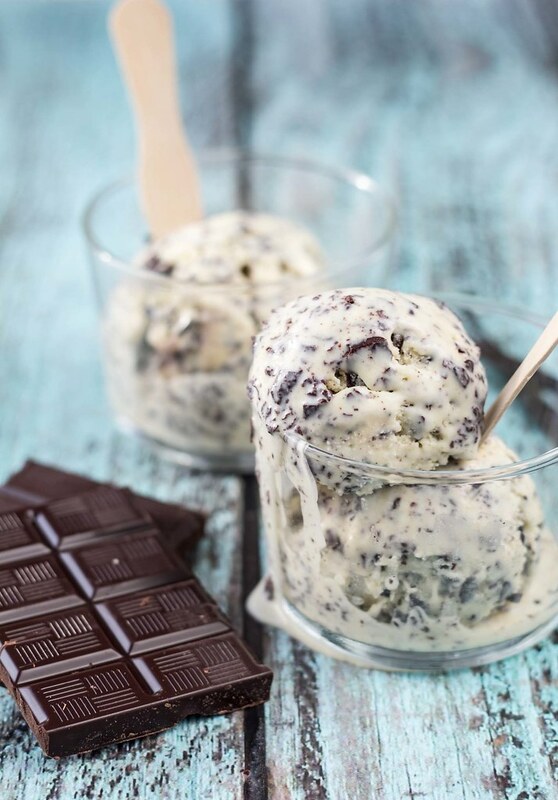 Actually we have always thought that a stracciatella ice cream was kind of boring – it’s just vanilla ice cream with chocolate – and that’s what it is. This ice cream can both be tasteless and boring, however, we have realized that this is only the case when you buy the mass-produced ice cream at the grocery store. 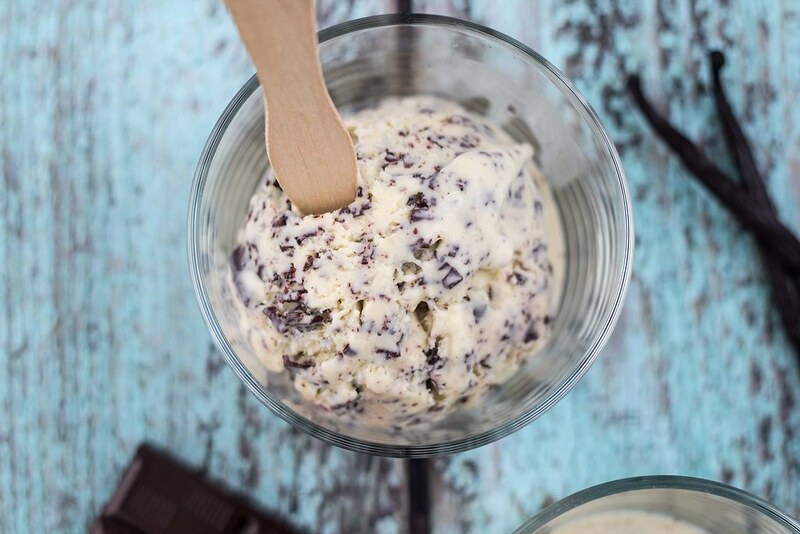 When you make a homemade stracciatella ice cream based on heavy cream and using only fresh ingredients this ice cream can be so delicious. A homemade version also doesn’t contain any artificial sweeteners and flavors but only pure sugar and vanilla from a vanilla bean – simple is the key word! 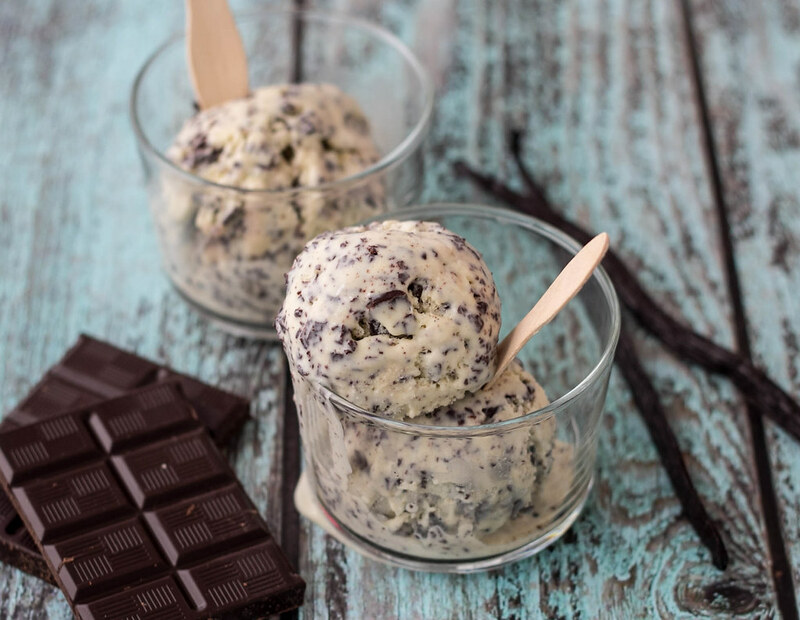 We have always though that a stracciatella ice cream was a vanilla ice cream with chopped chocolate but that it not entirely true. When we first made this ice cream we realized that the chocolate actually is melted chocolate poured very slowly into the almost frozen ice cream. This trick will make the chocolate solidify instantly into fine and long pieces/flakes – this is what makes this ice cream very special. Besides the chocolate trick, it’s also very important that the vanilla ice cream is based on a great recipe. We have listed our best vanilla ice cream recipe below, however, you can also find it separately on this page with our vanilla ice cream. 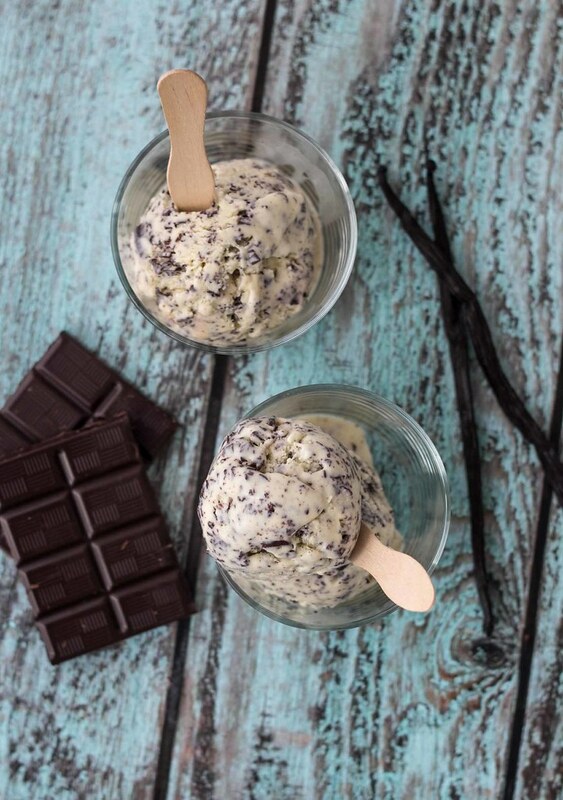 We have made several different ice cream – find the ice cream recipes here. The steps 1-6 is basically just the recipe for our simple vanilla ice cream. You can follow the instructions on our page with the recipe for vanilla ice cream or you can follow the instructions listed below. Step 1: Cut open the vanilla bean and scrap out the vanilla. We have made a simple guide how to do this – click the link. Step 2: Pour the corn syrup, heavy cream, milk and the vanilla into a saucepan. Also add the empty vanilla beans – they still contains flavor. Turn on the heat and let it all boil for about 2 minutes. Step 3: While you are waiting on the milk mixture to boil, pour the sugar and egg yolks into a bowl and whisk it all into a fluffy mixture. Step 4: When you have boiled the milk mixture for about 2 minutes pour it slowly into the bowl with the egg yolks while whisking constantly. Step 5: Pour it all back into the sauce pan and slowly heat it up while stirring all the time. Don’t let the mixture get above 80 C (176 F) this will make the eggs coagulate which doesn’t taste good in an ice cream. Step 6: The ice cream mixture will start to thicken around 80 C (176 F) – at this point pour the mixture into a small bowl and then place the bowl in a larger bowl filled with cold water. This will quickly cool down the mixture. Step 7: Pour the ice cream mixture into an ice cream maker and start it. You can also use your freezer just remember to stir in the ice cream every half an hour. Step 8: When the consistency of the ice cream is like soft-ice, melt the chocolate and pour it very slowly in the ice cream while stirring well. When the molten chocolate is hitting the cold ice cream it will solidify into small pieces. Step 9: Continue freezing the ice cream until it’s completely solid. Have made this a few times now and thought I’d leave a comment on how lovely it is. Thank you for posting! Quick question: i poured the chocolate in and instead of freezing into bits, it melted and turned into chocolate ice cream. Should it be hot or should it cool down before going into the ice cream? Hi. I normally let the chocolate cool down at bit before mixing it with the ice cream. If it’s hot directly from the stove it’ll mix with the ice cream in stead of turning into bits like you have experienced. Is there anything you can use as a subsatute for the Corn Surup? Oh, yum! This would also be amazing with fresh mint. Usually the mint is steeped in the cream. I don’t have a specific recipe, but I have used fresh mint for ganache and mint chip ice milk.